Hey Guys! Sorry for the late notice! We will meet at the Hanceville McDonald's at 5:00 p.m. to grab an icecream (or fries, or whatever you want) and then head on over to Wallace to view "1971". You don't need to RSVP...just show up! HANCEVILLE, Ala. — Today, news about leaks of government documents is nothing unusual. But 43 years ago, before WikiLeaks, Eric Snowden and even Watergate, the thought of anyone breaking into files at a government office to shine a light on governmental misconduct was unheard of. In the film 1971, a documentary by Johanna Hamilton, the story of eight individuals who stole documents from an FBI office in Media, Penn., will be told. Their plan was the find proof of spying on American citizens, and what they uncovered was much more. Documents mailed out to newsrooms “proved the FBI was deliberately working to intimidate civil rights activists and Americans nonviolently protesting the Vietnam War,” according to the film’s website. The Evelyn Burrow Museum at Wallace State Community College will show 1971 on Thursday, Oct. 15, at 6 p.m., as part of its Southern Circuit Tour of Independent Filmmakers series. The film is free and open to the public. Hamilton, an Academy Award nominated filmmaker, will be on hand to answer questions after the film. Hamilton co-produced Pray the Devil Back to Hell, the gripping account of a group of brave and visionary women who demanded peace for Liberia, a nation torn to shreds by a decades-old war. It premiered at the 2008 Tribeca Film Festival where it won the Grand Jury Prize for Best Documentary, and was later short-listed for an Academy Award. The film spearheaded the PBS mini-series, Women, War & Peace, which won the Overseas Press Club Edward R. Murrow Award for best documentary. She has produced non-fiction programs for PBS, The History Channel, A&E, Discovery Channel and The Washington Post/Newsweek Productions, among others. The Southern Circuit Tour of Independent Filmmakers is a program of South Arts. Southern Circuit screenings are funded in part by a grant from South Arts in partnership with the National Endowment for the Arts. South Arts, founded in 1975, is a nonprofit regional arts organization building on the South’s unique heritage and enhancing the public value of the arts. Their work responds to the arts environment and cultural trends with a regional perspective, and offers an annual portfolio of activities designed to address the role of the arts in impacting the issues important to our region, and linking the South with the nation and the world through the arts. 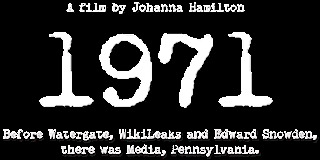 For more information about 1971 and see the film trailer, visit www.1971film.com<http://www.1971film.com/>. Filmmaker Johanna Hamilton will be available to answer questions about her film 1971, and her career as a documentary filmmaker after the screening on Thursday, Oct. 15, at 6 p.m., in the Burrow Center Recital Hall at Wallace State Community College.